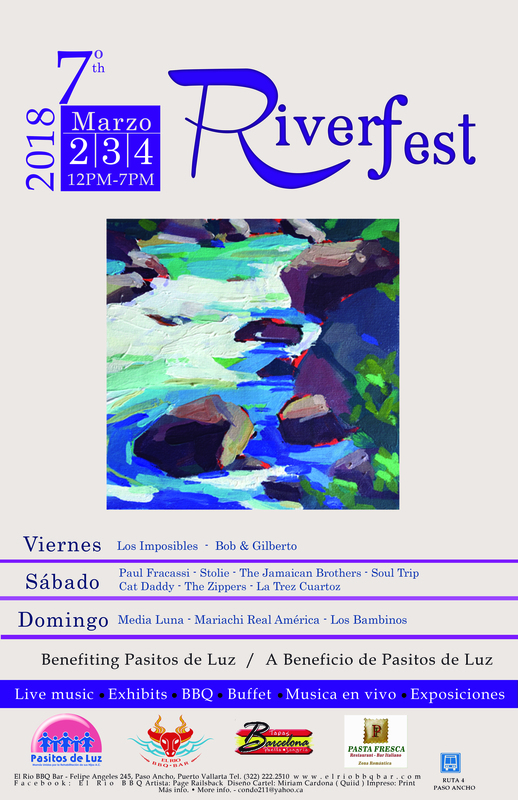 The fundraiser in benefit of Pasitos de Luz will take place March 2nd, 3rd and 4th at El Rio BBQ Bar. The 7th annual Riverfest music festival was recently announced by organizers. This year, it will take place March 2 – 4 at El Rio BBQ Bar (Felipe Ángeles 245, Paso Ancho) in Puerto Vallarta and will also feature art exhibits, expos and buffet. The line up of talent for the 2018 Riverfest includes Paul Fracassi, Los Bambinos, Los Imposibles, Stolie, Soul Trip and The Jamaican Brothers. Admission is $50 pesos on Friday and Sunday and $100 pesos on Saturday (at the gate only). But you also can buy a Saturday patron ticket in advance (limited). The cost is $800 pesos per patron ticket or a table for 8 people specifically reserved in your name for $6,000 pesos. Patron ticket holders get preferred early bird parking on a first come first serve basis, shuttle service if parked in the far lot, gate entry, welcome margarita or beer, guaranteed reserved seating area under cover, delicious free appetizers from about 1pm – 2pm, free non alcoholic beverages and sodas, bottled water and free buffet one time from 2pm – 4:30pm. Los Imposibles (TNT) at 2:00 pm followed by the ever-popular Bobbie and Gilbert from 4:00pm to 6:00pm. There will be 50/50 draw. Gate opens at 11:30am and music starts at 12:00pm. Musicians include Paul Fracassi, Stolie, Soul Trip, The Jamaican Brothers, Cat Daddy, La Trez Cuartoz and Sylvie and the Zippers. Also enjoy a day full of fun including artisan vendors, a silent auction of over 100 items, 50/50 draws. You can purchase beverages and our buffet including barbecue from El Rio BBQ, Barcelona’s Tapas paella and Italian from Pasta Fresca from 2:00pm to 4:30pm. Also, enjoy a guest appearance by some of the Pasitos de Luz children at 2:00pm. You can even get your haircut at the event by Alex Daoud from Alexander A Salon, who donates all his proceeds for the day to Pasitos de Luz! Riverfest will end the weekend with El Rio BBQ Bar bringing back its Sunday Mexican Grill Buffet (1:00pm – 5:00pm), featuring its famous slow-smoked ribs, hand-made tortillas and quesadillas, grilled chicken and smoked marlin ensalada, with Chef Hollis at the helm. 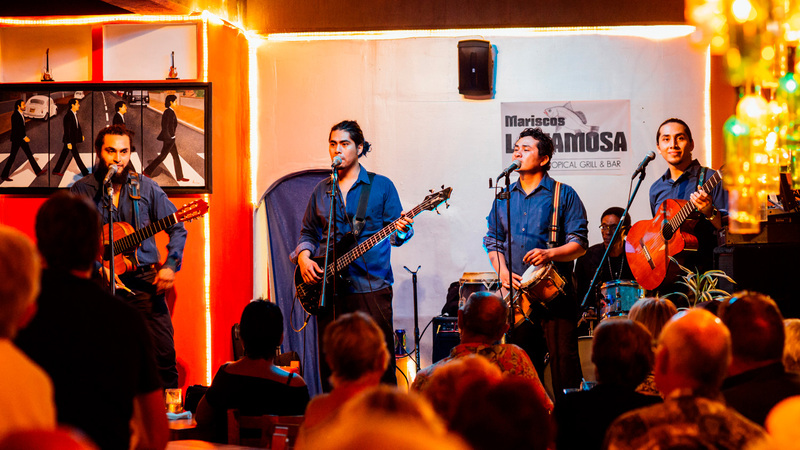 Beginning at 1:00pm enjoy Media Luna followed by Puerto Vallarta’s number 1 Mariachi “Real de América” at 2:00pm and at 3:30pm the amazing Los Bambinos, PV’s favorite brother band.